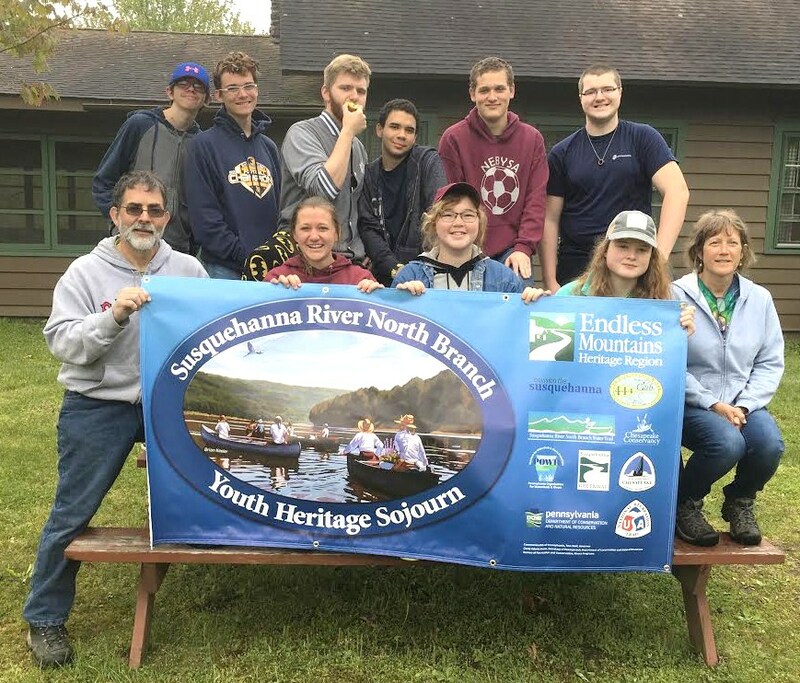 Representing the Northeast Bradford School District at the Endless Mountain Heritage Region Student Sojourn last weekend included (immediately above, front, from left) Brian Primerose, Krista Hallet, Tess Holstein, Eryn Nichols, Terry Primerose, (back) Joe Campbell, Evan Brown, Lipp Hallett, Dante Jeffries, Jacob Keir, and Gerald Holstein. 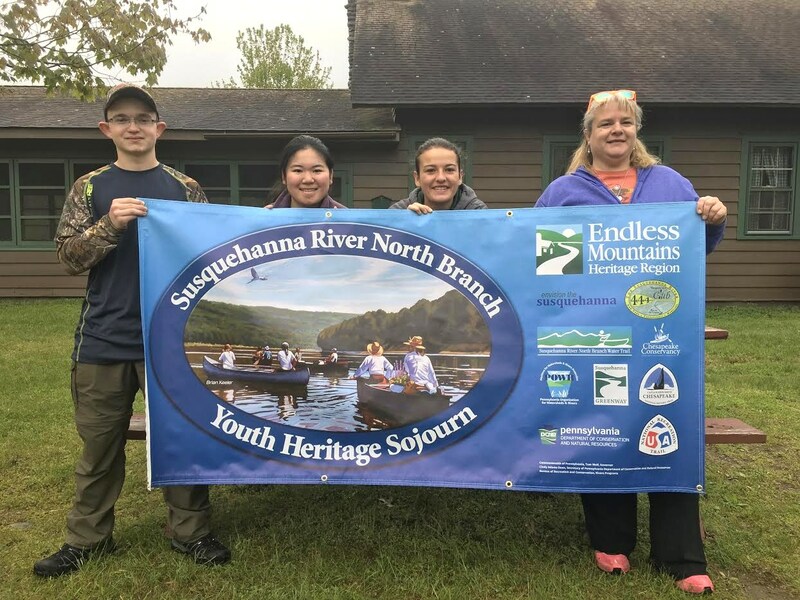 Although high water and a rainy forecast resulted in a modification of the three-day Susquehanna North Branch Youth Heritage Sojourn May 12 to 14, approximately 30 students and chaperons took advantage of access to Camp Lackawanna at Vosburg Neck in Wyoming County for a camping adventure that included games, presentations, campfires and music. 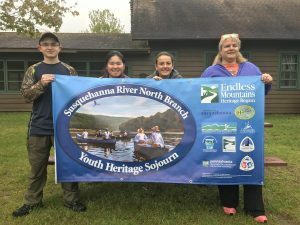 “Over the three days, the kids engaged in several team building activities, learned about survival skills, amphibians, watersheds, and the history of the area,” sojourn coordinator Keith Brown reported. 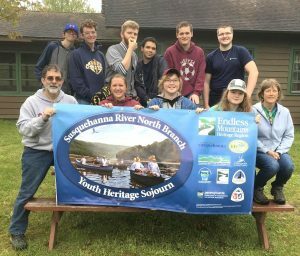 In addition to embarking on a number of survival skill challenges, students heard tales from local adventurist Charlie Anderson, music by Don Chapelle, and a history lesson from Joe Fischer. As it turned out, the weather on Friday was fine, but intermittent showers and drizzle on Saturday did not dampen the spirits of the campers, who could retreat to the comfort of their cabins or spacious Merrill Hall when necessary. 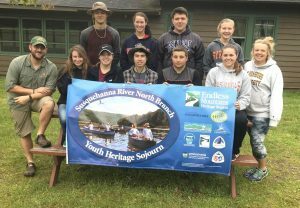 A number of schools opted out of the sojourn due to the expected weather conditions, but students from Northeast Bradford, Towanda, Wyalusing and Troy persevered with no regrets. Among the Wyalusing area students who took part in the adventure was foreign exchange student Rie Tanno from Japan. It was her first camping trip, Champluvier related, and Rie loved s’mores. Brad Tessier of Wyalusing garnered the “Last Boy Scout” award for his excellent attitude, interest in speakers, and eagerness to participate in all activities. “His Boy Scout training showed throughout the weekend,” Campluvier noted. Wyalusing student Emily Campluvier was one of a winning team for a late night “man hunt.” She and her teammates hid on the roof of a cabin and were never found. 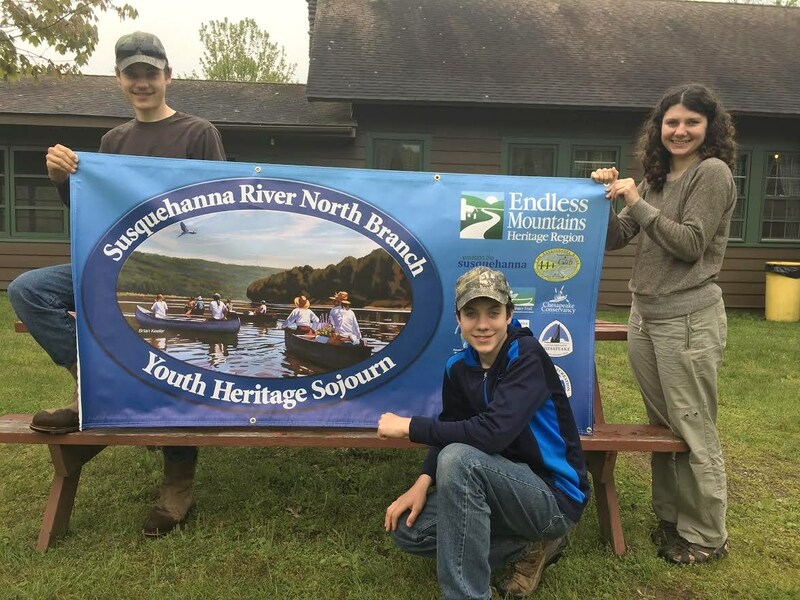 Key sponsors of the annual Youth Heritage Sojourn include the Endless Mountains Heritage Region, the Pennsylvania Organization of Watersheds and Rivers, Chesapeake Conservancy, Susquehanna Greenway Partnership, and PA DCNR. Additional sponsors for this year’s event included Community Bank and BradCo Supply. 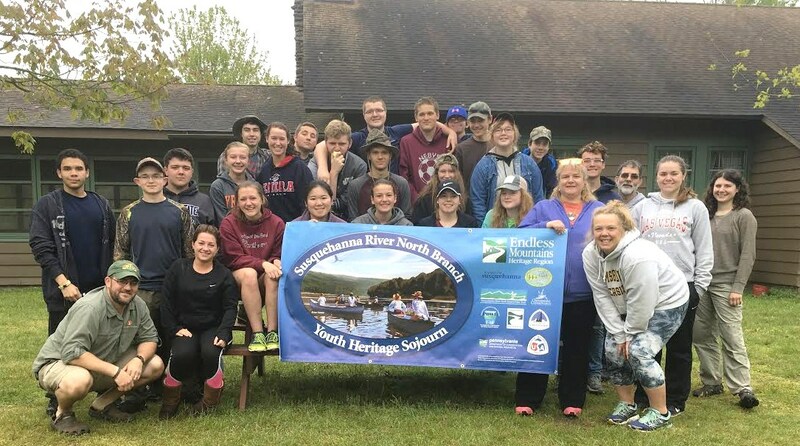 Towanda Area High School students who took part in last weekend’s EMHR camping adventure with teacher Keith Brown (above, front, left) included (continuing from left) Shelby Smith, Beth Benjamin, Steve Chenot, Richard Morse, Courtney Bennett, Caitlyn Doerner, (back) Chris Buckley, Cassidy Walker, Braydin Ryck, and Hannah Ryck. 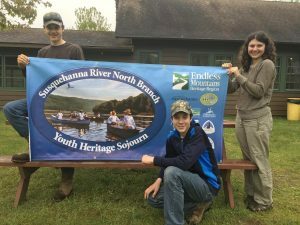 Representing the Troy area at the May 12 to 14 EMHR Youth Sojourn were (above, from left) Nevin, Brennan, and McKennaugh Kelley. 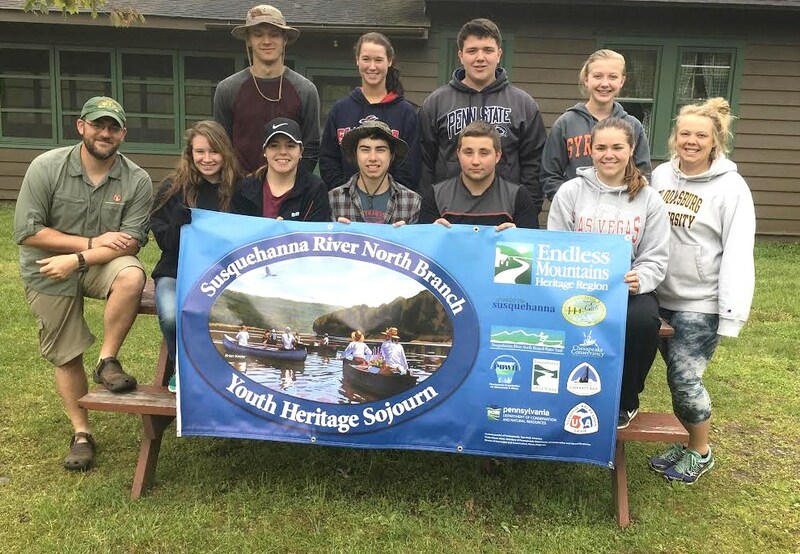 Wyalusing Valley High School students (above, from left) Brad Tessier, Rie Tanno, and Emily Champluvier enjoyed team-building activities at Camp Lacakwanna with chaperon Tina Champluvier and students from three other schools.